Who comes first to the mill, first must grind. This milling machine uses steel cylinders instead of naturel or artificial stones. 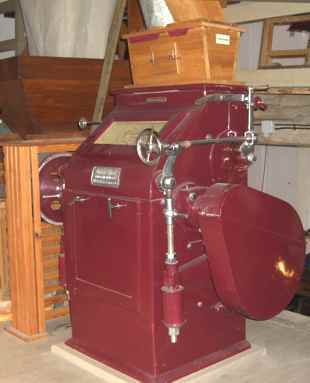 This is the first machine to start the flour production process by gradual reduction and separation. A set of rolls receives the clean grain along its whole breadth and thus sheds a thin film of wheat or rye on the two hard-cast cylinders with diagonal grooves working at differential circumferential speed. By the sharpness of the grooves and the advance of one roll the grain is torn apart and cut into particles, but not completely crushed. This milling procedure turns out the "chop", a mixture of coarse meal, semolina which is the endosperm finely-granulated in different grades, and fine flour. The chop has to be separated by the sieving machine on the top floor. The elevator is carrying it up to the plan-sifter through 3 storeys.